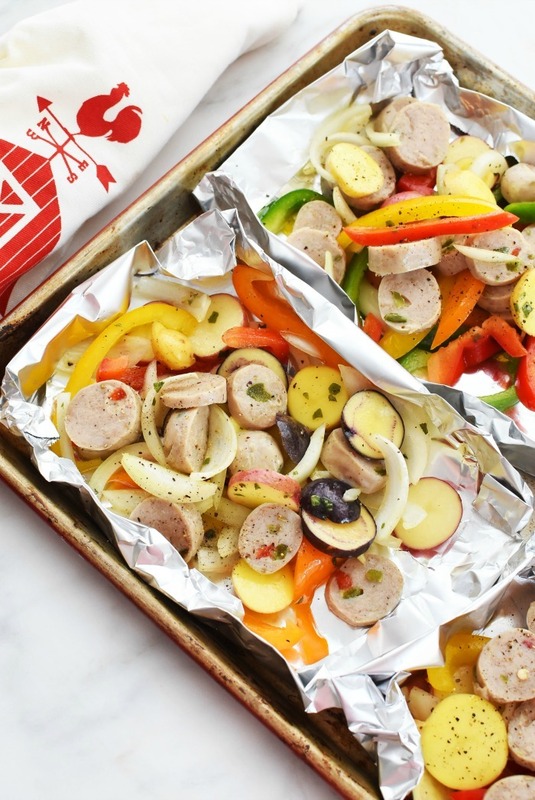 Are you looking for a delicious foil packet dinner idea for tonight? 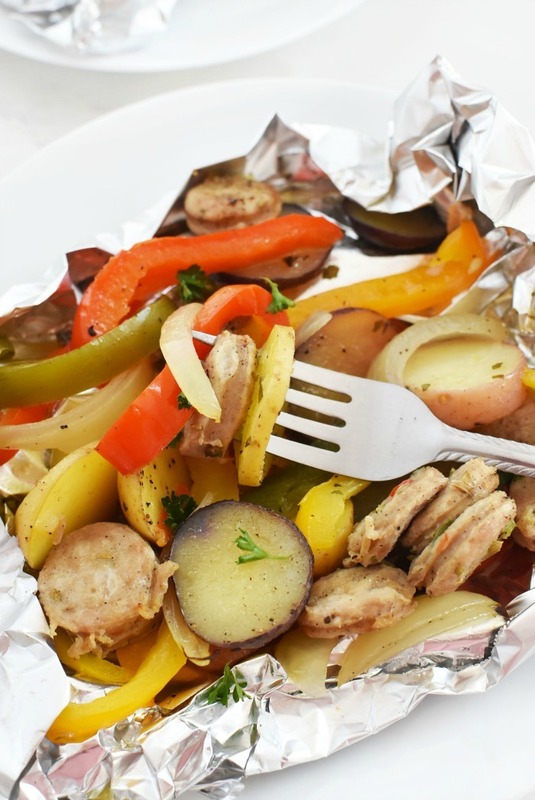 This easy recipe uses Sweet Italian Chicken Sausage, onions and peppers cooked in the oven to perfection inside a foil packet. This post is sponsored by al fresco Chicken Sausage. All views expressed are our own. Spring is finally here in New England and we have been spending much more time outside. It is not quite the official grilling season and the weather fluctuations between freezing and warm so I am still using my oven. 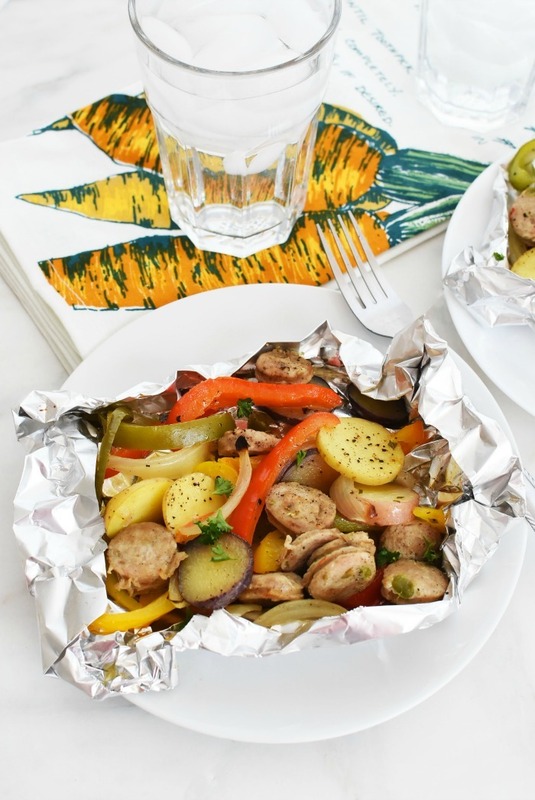 This past weekend, I made some foil packets with my favorite flavor of al fresco Chicken Sausage which happens to be the Sweet Italian Style. I love how this chicken sausage is fully cooked and contains 70% less fat than traditional sausage varieties. It is also gluten-free, and is made with lean, skinless chicken meat. 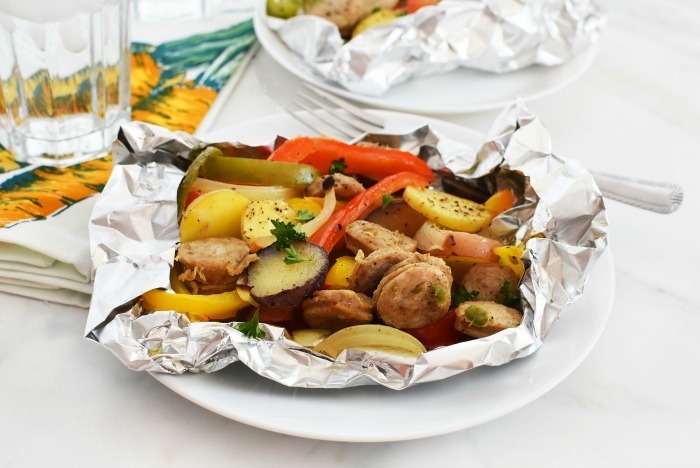 al fresco Sweet Italian Chicken Sausage was the perfect protein to add to my foil packets because it gave the meal such amazing flavor. Paired with the perfectly seasoned sweet bell peppers, fingerling potato slices, and tender onion; this meal was a keeper! 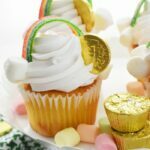 What is a Foil Packet? A foil packet meal is simply a meal that is wrapped in two pieces of foil to create a pouch that steams the contents as it bakes. The first time I ever had a foil packet meal was at my Mother in Laws house. Her husband added fish, lemon, potato, and asparagus to each packet, sealed them, then grilled them for about 30 minutes. 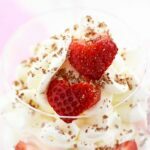 When it was time to eat, the final result was so delicious that I had to try this method of cooking at home. To make foil packets you will need quality, heavy duty aluminum foil. I used (2) 10″ teared pieces for each pouch. 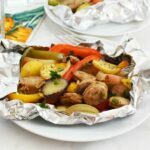 This recipe made 4 hearty pouches and requires 8 total piece of foil. 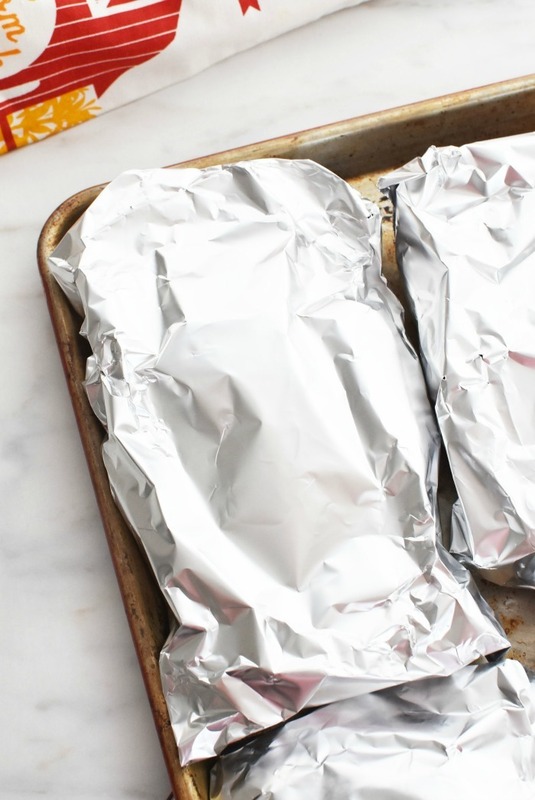 To fill the pouch, simply add the portion of your meal to each piece of foil. Carefully fold up the edges to make a box of sorts to keep the juices in the meal. For the top piece, cover the top of the meal and fold the edges to the first piece of foil to make a pouch. What Foods Can You Cook In Foil Packets? 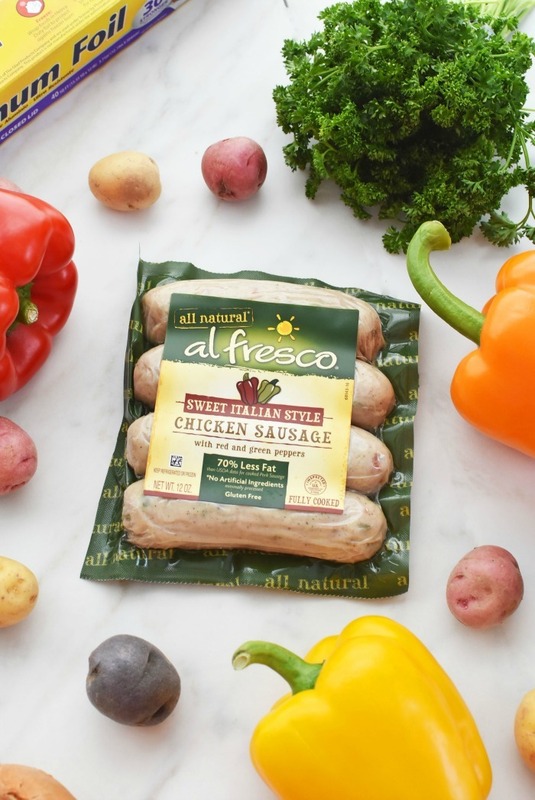 al fresco Chicken Sausage – they have 10 delicious varieties that can bring lots of flavor to any foil packet combo! 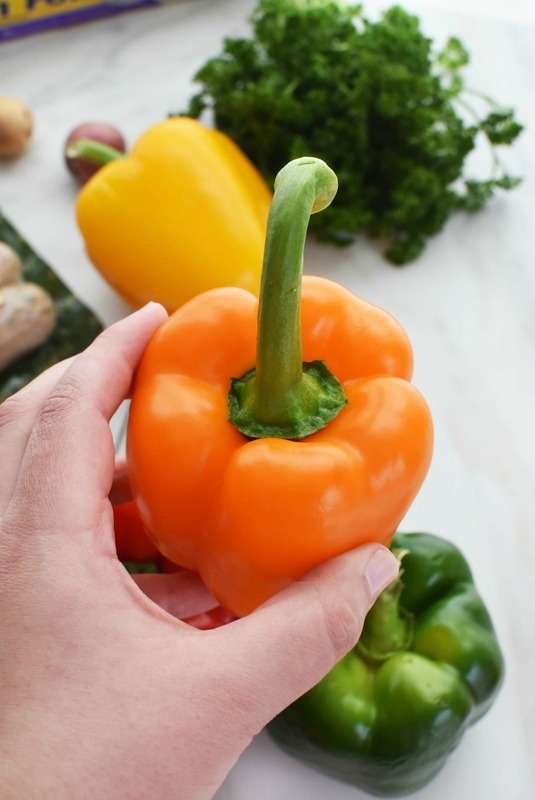 Veggies including: potato (thinly sliced, onion, asparagus, peppers, zucchini, squash, broccoli, carrot, and more! When cooking your pouch in the oven, I used a temperature of 400 degrees f. for 30 minutes. I added the four foil packets to a large baking sheet for ease of use and cooked them on the center oven rack. Once your packets are done they will be hot and steamy. Use a knife to vent a small hole before CAREFULLY unwrapping them with oven mitts. Remove the cover and either add the foil packet to a plate, or dump the contents onto one & enjoy! Inside, you will find the most tender, sweet, and deliciously spiced sausage and veggies. This meal was such a keeper and I cannot wait to try all al fresco’s different varieties to mix up mealtime. 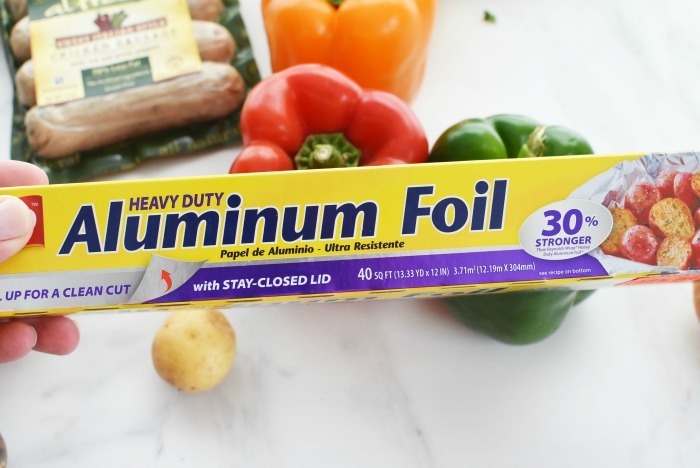 Will you be trying this foil packet meal? 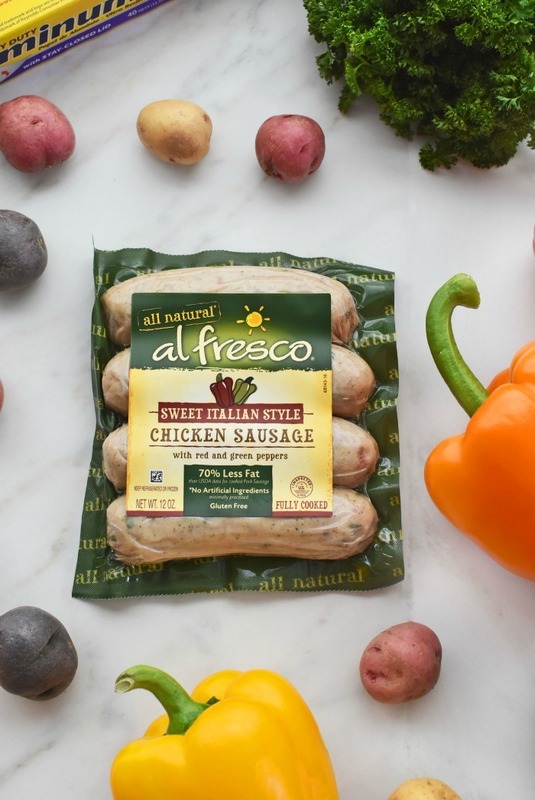 What is your favorite variety of al fresco Chicken Sausage? 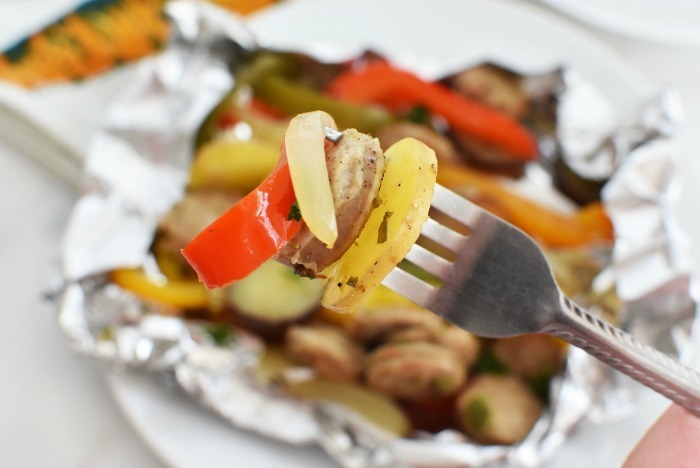 Are you looking for a delicious foil packet dinner tonight? 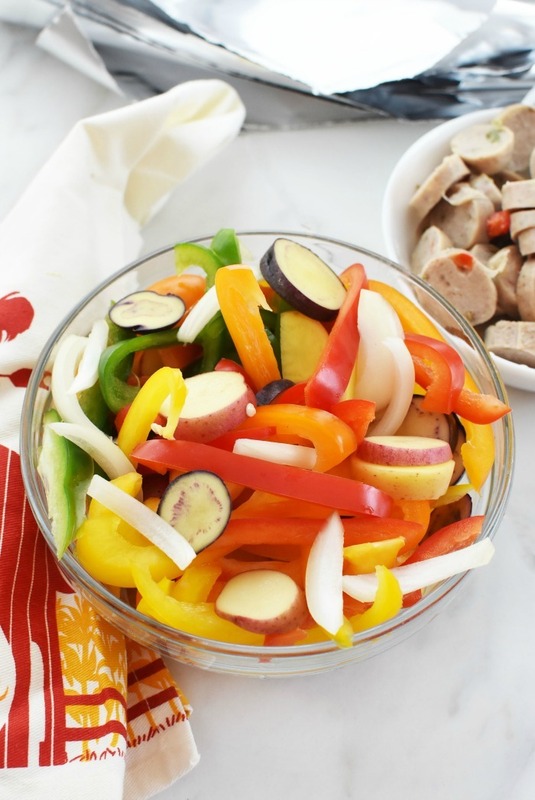 This recipe uses Sweet Italian Chicken Sausage, peppers, and onions & is cooked to perfection. Tear out 8 10″ slices of heavy duty aluminum foil. Add contents to center of foil. Tuck up edges of foil. Cover bottom with top foil sheet and tuck over edges to create a covered pouch. 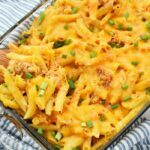 Bake for 30 minutes on a large baking sheet. When foil packets are done. Slice a small vent hole to vent the steam and use oven mitts to remove the top foil layer. 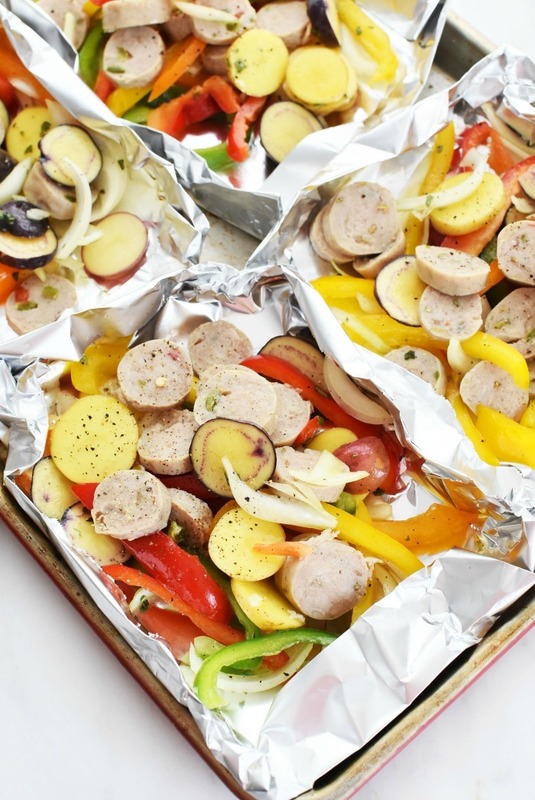 Our family likes to camp when the weather is nice, and these foil meals would be perfect! We did foil packet dinners when I was younger and we camped. I loved all of the flavors combined! Too bad i cant indulge in chicken sausage anymore. Before I was pescatarian a year ago this was the only type of sausage I could eat because I wasnt a pork eater. I love foil packet dinners. They make clean up so easy. 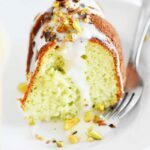 I have to give this recipe a try. Those chicken sausages are calling my name. I’ve made one thus past weekend! It was sooo good! Only way my teen will eat veggies! I love making foil packet dinners. Are usually make mine with steak or chicken. I never thought about using these sausages! Thanks for the tip. Oh wow. I’ve never tried cooking like this before. 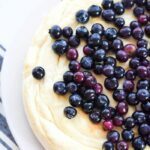 It’s interesting for me and I know I need to try this delicious recipe. I love cooking the foil dinners! So many possibilities with veggies and proteins!